This past week I rearranged the pictures on the walls in my home. Nothing new to put up, but due to the fresh paint, why not give a change to the sayings and plaques that cover them? 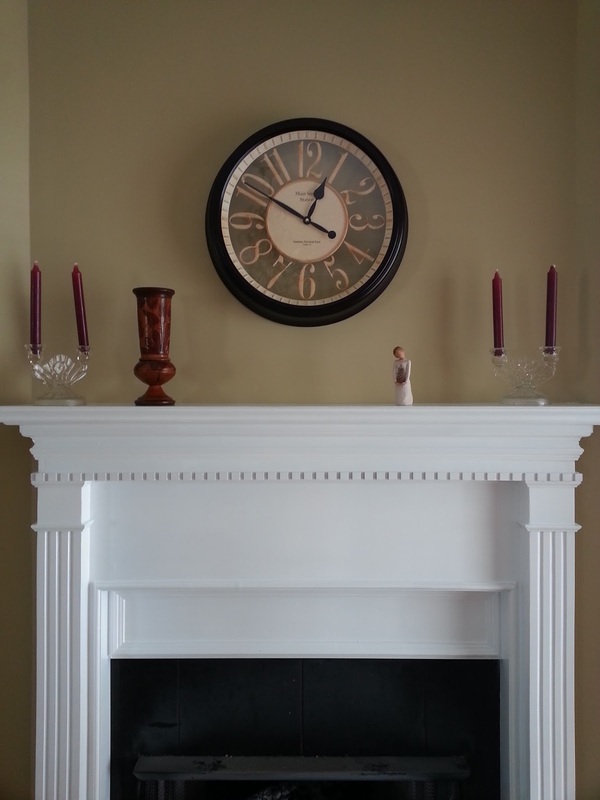 It all started with replacing the large mirror over the mantle with the large clock that had previously been on the wall between the kitchen and the den. Nice, we can see what time it is without getting up to look around the wall! But the question now is where to put that large mirror. We have put it, temporarily I might add, over the sofa in the front room. It just has not found it's home yet, so I am continuing to struggle with it everytime I walk past it. What is amazing is how often we get up to look around the wall to see the clock! Here it is, right before our eyes, but we look back to the old wall. There replacing the clock is a group of crosses, that our friend painstakingly made for us. 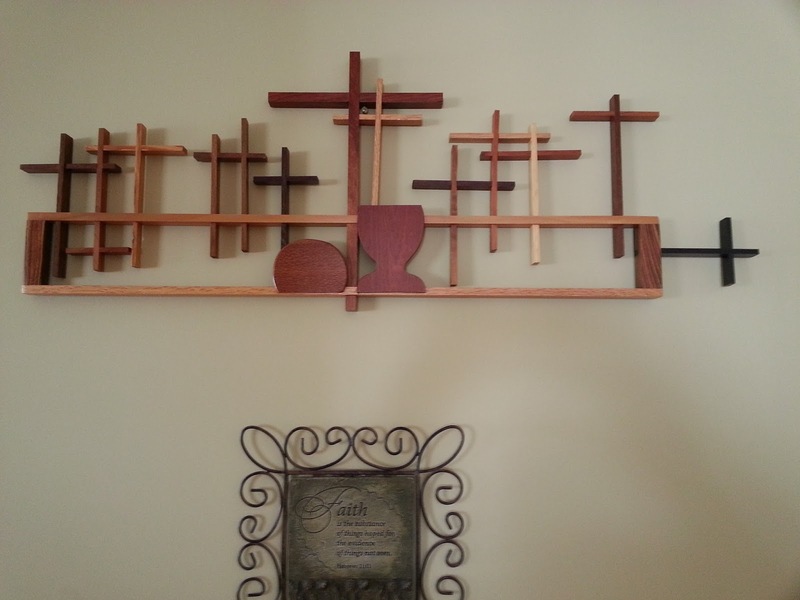 It is actually a layout of the Lord's Supper, but at each place there is a cross that represents each disciple. We have a large cross in the center, representing Jesus and even Judas is a black cross, sideways of the table. So now, when I cast my eyes to where time once hung, I now see the crosses. I stopped and thought about that this morning. The crosses represent time that started the Christian walk for me. 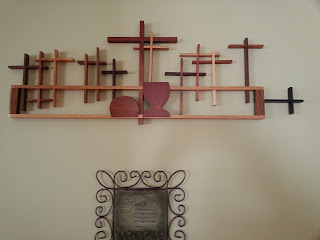 Each of the these crosses played a part in where I am today as a Christian. Wow! This made me turn to look at the clock over the mantle and how fast time was ticking in my own life. Have I, do I, make a difference? I am nowhere near where these men were and I know that I still am climbing to be acceptable to Him. The difference now in my life is that I can now see the cross, where time literally stood still, where my own clock once hung. This is a message to me focus not on my own time, but that of Christ. We as Christians need to be focused on His timing, not our own, in daily life. We should look to each day as a new beginning and take it one day at a time. For no one knows what tomorrow will bring. Live each day to the fullest, seeking His face in all that we do. The mirror is just a reflection of what is on the other side of the room, it has no meaning, just hangs over the sofa. But we as Christians should be a reflection of Christ, shining His light across and around the world.